This weekend I saw two movies. One has space battles in a universe that painstakingly recreates the look of 1977’s Star Wars. The other is a love letter to Los Angeles made by a bunch of people born in the 1980s. The fact that I ended up loving the latter one is proof I don’t understand how the world works anymore. I loved La La Land, and I loved it for exactly what it was trying to do. Much like The Force Awakens transported me back to the feeling of watching Star Wars for the first time, watching La La Land often took me back to the first time I saw Singin’ in the Rain or An American in Paris. Obviously it’s not the first attempt to recapture the magic of classic musicals, but it’s the most successful I’ve seen. The trick, I believe, is that its sense of self-confidence completely obliterates any sense of self-awareness. It feels not like someone wanted to make an homage to classic musicals, but that somebody wanted to make a movie about the magic of Los Angeles and decided that of course a classic musical would be the best format for that. Once that decision was made, everyone went all in and made a musical with all the earnest enthusiasm that seems to have skipped my generation. Any hint of a wink at the audience would’ve been grounds for immediate dismissal. Or, I guess, its success could just be on account of Emma Stone and Ryan Gosling’s preternaturally appealing chemistry. I will say that Gosling’s always seemed fine but unremarkable to me, but his performance here is outstanding. Partly because his character is really kind of annoying and insufferable, but he manages to make arrogant stubborn passion seem sympathetic if not exactly likable. He plays a guy who loves jazz and evangelizes it, and yet I wasn’t immediately turned off, which is a monumental achievement on its own. (And I’ve got to say if you’re in the portion of the audience that’s into dudes: much like Gene Kelly, Gosling is an actor that doesn’t really do a whole lot for me until I see him dancing in a well-fitted shirt). Emma Stone can do pretty much whatever she wants and remain effortlessly likable, since that’s her thing. The movie starts with a bunch of 20-year-olds all dressed in primary-colored T-shirts or sun dresses all dancing and skateboarding (!) on and around cars stuck in a traffic jam on a freeway off-ramp. It’s odd to see that not being used to sell me Coca-Cola or a Prius. Even though my cynicism threw up a shield, the enthusiasm of that opening number wore it down. It bugged me initially that the movie seems to favor “naturalistic” vocals, so they seem quiet, breathy, and out of balance against big orchestrated music, but it didn’t take me long for me to stop caring. (Unlike, for example, Les Miserables, which demands over-the-top vocals from almost every character, and which wasn’t as kind to actors-who-also-sing). By the time Stone and Gosling are dancing on a bench in Griffith Park, I’d been completely won over. One of the only complaints I’ve heard about La La Land is that the pacing drags in the middle. I was on the lookout for that, and while the scenes with John Legend didn’t interest me, I inferred that that was kind of the point. His character represents success without passion. I don’t believe that the story dragged so much as I stopped thinking of the movie as a musical for an act or so. I don’t believe that’s a flaw; I think it’s structurally perfect: when it “turns back into” a musical again during an audition sequence, I was genuinely surprised, and it made that song more powerful. 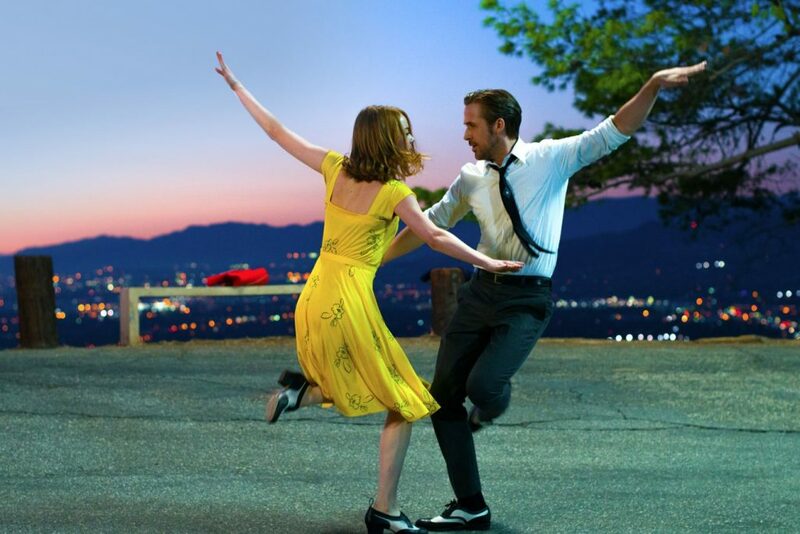 I’ll try to be deliberately vague and not completely spoil anything, but: the end of La La Land pays homage to the extended ballet sequences at the end of An American in Paris and Singin’ in the Rain, in which the movie’s narrative stopped in favor of a bunch of fantastic imagery and dancing. I say it’s here that La La Land shows its intentions and its double identity: it’s more indie film romantic drama/comedy using the structure of classic musicals than just an homage or recreation of those musicals. It delivers two versions of its finale, which I first thought was an attempt to give everyone what they wanted. But after thinking on it some more, I realize it’s the crucial coda that has to be appended to any story about the magic of Los Angeles and the beauty of following your passion: it reminds us how much of our lives are controlled by fate and timing. You can (and should) follow your dream, but you’re not guaranteed stardom and fame like, say, Emma Stone and Ryan Gosling, since it’s often talent and hard work combined with meeting the right person in the right conditions at the right time. And it’s that mentality that lets the movie be earnest and joyful and optimistic without feeling too trite, treacly, and over-simplified. I don’t think it’s perfect, and I still don’t like jazz, but any flaws that it has don’t just fade away but go into making it a unique and seemingly sincere creation. It’s just delightful. This weekend I also saw Rogue One: A Star Wars Story. I was genuinely surprised by the movie, since when I heard it was about getting the plans for the first Death Star, I never imagined that about half the movie would actually be about getting the actual physical plans for the first Death Star. But its production design was absolutely perfect, from the costumes to hairstyles to spaceships to “incidental” technology. It took everything from 1977’s Star Wars not as a necessary limitation of available technology, but as an assertion of style for a certain time in the Galaxy’s history, and that’s brilliant. I also really liked Alan Tudyk’s performance as K-2SO, and I thought the CG on his character was seamlessly integrated with the live actors.